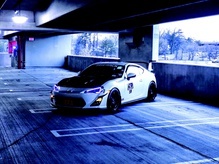 Toyota has hyped their new Scion FR-S to the skies. The brand is trying to reignite its sporting torch—one that has stayed relatively unburned for some time. Sure, many of the FR-S’s parts are from cars with the Pleiades in its logo, but we’re not going to over-scrutinize this gift horse. We’ll simply appreciate that there’s finally another notable sports car wearing a Toyota badge. Scion. Whatever. 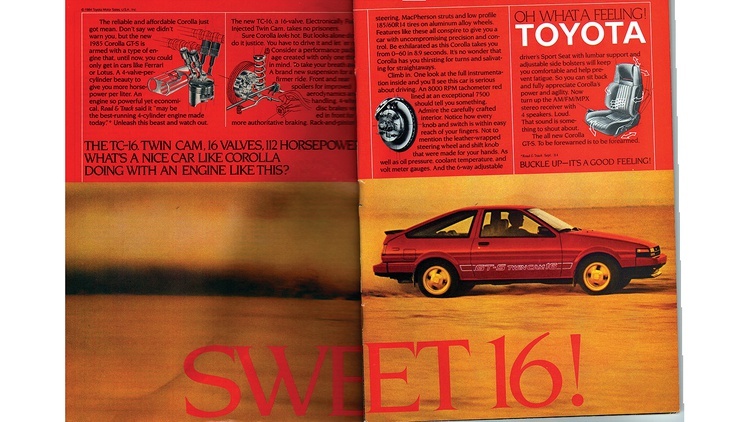 There was a time when Toyota’s sporting torch burned intensely. Big V8s were castrated and the oil crisis brought American muscle to its knees. 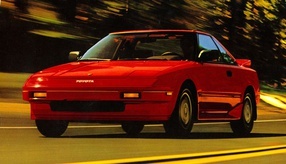 Small imports with four-cylinder engines were taking big bites of the market, and Toyota’s 4A-GE was one of the high-tech mills responsible for the insurgence. Culling 112 horsepower from a mere 1.6 liters took a cylinder head with twin cams, a 9.4:1 compression ratio and a variable-length intake manifold. That’s half the horsepower of a contemporary Mustang GT, but with one-third its displacement and considerably less weight. 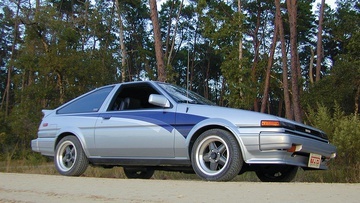 The Corolla was still a rear-wheel-drive car at the time. Do we need to spell it out for you? Being a Corolla, the GT-S had the goods to be a low-cost car, and its light weight gave it great handling and plenty of character. “Oh, what a feeling!” indeed. These attributes made it a popular car for those pursuing fun on a budget, but they also highlighted one of its pitfalls. It’s suspended by a live axle at the back rather than an independent suspension, and it’s a bit heavy for the power: 2300 pounds. These are figures to look back at and lose perspective. The first Mazda Miata had similar power, a bit less weight, and fully independent double-wishbone suspension all around. It would easily beat a GT-S in most types of competition—but the Miata didn’t exist until two years after this Toyota passed on. The GT-S was groundbreaking. The relatively short run of this fast Corolla—1985 to ’87—makes it a hot commodity on the used market today, especially in the Los Angeles drift scene. Prices there are much higher than elsewhere in the country, but it’s hard to find a clean, unmolested car at any price. Figure $5000 to $10,000 for a decent example, though a well-kept, clean, stock car in the L.A. area can stretch well into the teens. You can find cheaper cars, but they often have low-quality modifications. There’s a lot of performance available in other cars for that kind of money, so if you’re not particular about your whip, a Hachi Roku isn’t right for you. This car—available both as a hatchback and a coupe—is for the person who wants that classic ’80s style and plenty of street cred, not for someone looking for a modern speed bargain. Antonio Alvendia, the founder of Cipher Garage and Motor Mavens, is a die-hard AE86 fan. We mined his noggin for these fine nuggets of buying and ownership advice. The aftermarket is filthy with suspension and other mechanical parts for the AE86. If you dream it, someone’s made it, and someone else has probably made an imitation. When buying a modified car, take into account the quality of the upgrades used. Look extra carefully at cars that show signs of drifting. This kind of competitive driving is harder on a car than road racing because of the need to upset the chassis. Owners will often fit an aggressive clutch so they can do clutch kicks when they need to break the rear end loose, and that sends strong shocks through the driveline. The transmission isn’t extremely robust, and will eventually break under this kind of driving—or if the engine is turbocharged. Find a car with a complete, original interior and you’ve struck gold. Though mechanical bits are readily available, interior pieces like door panels are expensive and hard to find. Look for uncracked dashboards and clean seat backs. The parcel shelf from a hatchback is also a rarity today. Typical rust problem spots are on the front fenders, around the fuel filler door and around the sunroof, if equipped. Replacement fenders are readily available—even in fiberglass and carbon fiber. You don’t need expensive goods to make the car drive well. If you’re on stock springs, replace old shocks with off-the-shelf units from your favorite big-box store and swap out the tired rubber suspension bushings for new ones. Its extremely short final-drive ratio of 4.3:1 makes this car fun and fast around town and for zipping through traffic, but it’s screaming high revs at 80 mph. Keep that in mind if you’ll be taking it on long drives. Those looking for even shorter gearing for competition use can get a 4.77:1 differential from the Toyota box van of that era. Over long-term use, keep watch on the axle bearings and ring-and-pinion bearings, as they have a tendency to wear out. The clutch-type limited-slip differential is easy to spot without jacking up the back end. Stick your head under the bumper and look for a sticker on the differential housing that specifies limited-slip gear oil. You can also identify an LSD by the vehicle identification number: T282 in the VIN indicates an open differential; T283 means an LSD. Major horsepower is not easy to make. A well-tuned 4A-GE engine with good upgrades will make 150 horsepower. A Formula Atlantic engine will cost $10,000 and provide 200 horsepower—or you could buy a Honda S2000 instead. Don’t over-rev old engines. The 4A-GE has small main bearings that don’t take well to abuse. Take precautions to prevent oil starvation: Good oil pressure is a must at all times. A popular engine upgrade is swapping the high-compression, Japanese-market engines from the AE92-chassis Corolla GT-S. These have bigger main bearings and piston oil squirters. They’re a better foundation if you’re after big power. Do not use aftermarket ignition amplifiers, as these will blow the igniter, which is already problematic. Keep a spare igniter and distributor with you. And just to be extra clear, when Americanizing the Japanese “hachi-roku” for this model, it is pronounced as “eight-six”, not “eighty-six”, in which Matt Farah of the smoking tire has a sad habit of saying all the time and sounds like a complete buffoon for doing so. In Ireland if you said Twin-Cam it meant only one car no matter how many other manufacturers had engines with twin-cams. Kinda obvious since most had a giant sticker on the side saying...Twin-Cam. Still having your own iconic nickname is the mark of a cars stature. I love my GT-S. Except its boisted so not much of the oringinal power delivery is there. I remember shopping at a Toyota dealership in the late summer of 1985. I'm not even sure what kind of car I was looking at, but I asked the salesman, "What's that Twin Cam 16 Valve thing over there?". He said, "It's a great little car, but it's way out of your price range." And so I left and bought a new Chevy Cavalier that afternoon. Still kind of kicking myself for not buying a former-TRD racecar I had offered to me around 2000, but the lack of title, and my lack of a truck/trailer/money sort of killed the deal for me. I never even considered the Corolla. Test drove an MR2 (same engine) and decided "I'm buying this car" before I even got out of the lot. Having owned a Cavalier (albeit a 1994) as well as a 1980 Corolla (TE72 chassis, the AE86's predecessor), I feel sorry for you Woody. At least I feel sorry for 1985 Woody. Part of me would still love an 86, the part of me that knows the Miata world has far more potential and aftermarket support just can't see it happening. Still... it's an experience I want in my life, knowing just how much fun these old Corollas were.